Some say they never happened, while others assert that the football matches and kickabouts rumoured to have taken place during the 1914 Christmas truce up and down the Western Front during the First World War were conjured up – a byproduct of a quickly fading romanticism that had been shell-shocked into a state of reality revealing the lengths that humans will go to destroy one another. In the United States, it’s referred to as ‘War Cause Marketing’, elsewhere it can be seen as war profiteering, which can be seen as a crime. Advertisements and film directors have never been bashful about making magic out of myths, nor has the public’s consciousness ever resisted the temptation of having its emotional threshold satiated. The fact is we will likely never know the truth about what took place along the Western Front in relation to football, but we do know the effects of it, which are worthwhile. For the uninitiated, the story undulates between mythology and detailed circumstance and because of that, the truth is likely lost somewhere in between. Even if the fraternization did not commence with the Germans singing Stille Nacht on Christmas Eve or nobody really remembers bringing a football to the front lines, the story remains one draped in mystery, heartbreak and hope at Christmas time. It’s easy to see why war stories have a way of revealing humanity, for better or for worse. From the first shots fired during the German invasion of Belgium in August 1914 to the Battle of the Frontiers, the Battle of the Marne, fighting in Ypres, and countless other conflicts on a truly global theatre, the innocence of the 20th century had been destroyed; new boundaries of turmoil and suffering were established daily; thresholds for pain and loss of life must have read like misprints (and still do) in periodicals on the home front as the multifarious reports indicated this was a different type of war. This was hell on Earth. Thumbing through old and out-of-circulation history textbooks on the subject of the First World War, one finds a historical wormhole of stories within the story. The fact is by December 1914, the First World War was turning into a meat grinder. Soldiers on all sides of the conflict were tired – tired of fighting, tired of watching their friends and even their enemies die, tired of waiting for their turn to die. They were also exhausted, disillusioned, punch drunk with fury, and intoxicated on the fumes of idealism, many soon to be choked to death by the poison of war, quite literally. So what does all of this have to really do with football? On Christmas Eve 1914, as legend, war journalism and eyewitness accounts indicate, soldiers hunkered down in trenches no further than 150 meters away from the enemy in a network of channels and human trough lines stretching across the north of France all the way to Switzerland. Separating the warring sides was No Man’s Land, and it doesn’t matter what side initiated the ceasefire, what matters is it happened. The fighting stopped. The 1914 Christmas truce was not the first unofficial truce of this great conflict, but certainly one of the last. The sound of the other side’s conversations, laughter, groaning and singing replaced the falling of shells and the rain of steel. One has to imagine how much warfare had changed the men ensnared in this conflict. Battles lasted months, not days. The loss of life, the concussion of artillery, the obliteration of the human body and psyche mired soldiers into a nightmarish world they could not imagine. It’s not hard to envisage young men dreaming of life’s pleasantries back home: wives, family, children, hot food, clean sheets … football. Most accounts say it was the Germans that started the Christmas celebration as their clocks would have indicated it was Christmas back home one hour earlier than the British and French – again, it really doesn’t matter. What does matter, at least for this writing, is soldiers looking across No Man’s Land and not seeing carnage, but rather seeing tiny Christmas trees with candles pop up on the German side; or Allied soldiers holding up cigarettes and waving their caps. The sound of music and laughter filled the lifeless void their world had become. Initially, both sides planned to deploy their burial and body retrieval squads before the next day’s fighting took place as that would have been the “humane” thing to do in war. What is perhaps one of the most intriguing aspects of this event are accounts of soldiers looking over at the enemy and seeing someone who looked quite like themselves. Commanders and politicians told them they would see bloodthirsty brutes and monsters of men on the other side. After six months of fighting the Great War, the soldiers were tired and homesick. Most were told they’d be home for Christmas and some overzealous accounts suggested they’d all be home by Christmas; however, the stubbornness and evolution of warfare by Christmas Eve suggested that was far from the truth. Perhaps that is why the postmen carrying and collecting letters and gifts saw a shift in the soldiers on both sides. On some trench lines, orders to fight were blatantly ignored and on others, the commanders themselves silenced the guns. It is at this point where faith in their fellow man was perhaps made possible through football in addition to the exchanging of gifts, handshakes, cigarettes, and pictures of sweethearts back home – where ever that may have been – if only for a few hours. A 19-year old Private in the 6th Battalion Cheshire Regiment named Ernie Williams stationed near Ypres, Belgium, depicted how football brought the two sides together in Peter Hart’s book, Fire and Movement: The British Expeditionary Force and the Campaign of 1914. Williams also recounted his story with minor variations in a recorded 1983 interview. “The ball appeared from somewhere, I don’t know where, but it was from their side – it wasn’t from our side where the ball came. It was a proper football. They took their coats off some of them and put them down as goalposts. One fellow went in goal and then it was just a general kickabout. I should think there would be at least a couple of hundred taking part. I had a go at it – I was pretty good then at 19. Everybody seemed to be enjoying themselves. There was no sort of ill-will. The same book shares an account from the German perspective as Lieutenant Johannes Niemann of the Saxon 133rd Regiment told of a football match between the Germans and the Argyll and Sutherlands Highlanders deployed in the BEF: “A Scottish soldier appeared with a football which seemed to come from nowhere and a few minutes later a real football match got underway. The Scots marked their goal mouth with their strange caps and we did the same with ours. It was far from easy to play on the frozen ground, but we continued, keeping rigorously to the rules, despite the fact that it only lasted an hour and we had no referee. As romantic and noble as the 1914 Christmas truce remains in legend and lore – football was also used for propaganda purposes once word got out that games were played instead of fighting taking place. For example, the Frankfurter Zeitung published an editorial deriding British and German soldiers for being footballers on the day and for “exercising their long limbs on the football ground” instead of fighting and dying on the front line. In Great Britain, the undercurrent of the football matches of the 1914 Christmas truce tells of the less than sparkling effect football had on the First World War. Critics point out that sport, namely football and hunting, were used as part of several propaganda campaigns to recruit men out to the front, especially as the casualties began to mount. Additionally, the Football Association’s contentious resolution to continue with the 1914/15 season during such a conflict put the FA under pressure from the national press by claiming the FA was discouraging and distracting fans, both men and boys, from joining the soldiers by persisting with league play, thus offering them football as an aversion. 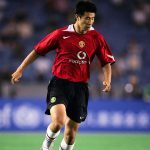 But what draws people to the stories of football matches is perhaps the imperfect subjectivity of the told events, which oscillate between brilliant war stories and anomalies of the shattered minds of those present that day. Where one soldier sees a proper football game, another sees globs of fools playing bunch-ball and gallivanting with the enemy; where fresh-faced boys from Germany see their Allied counterparts, the commanders and politicians see insubordinate youths failing to kill at will. 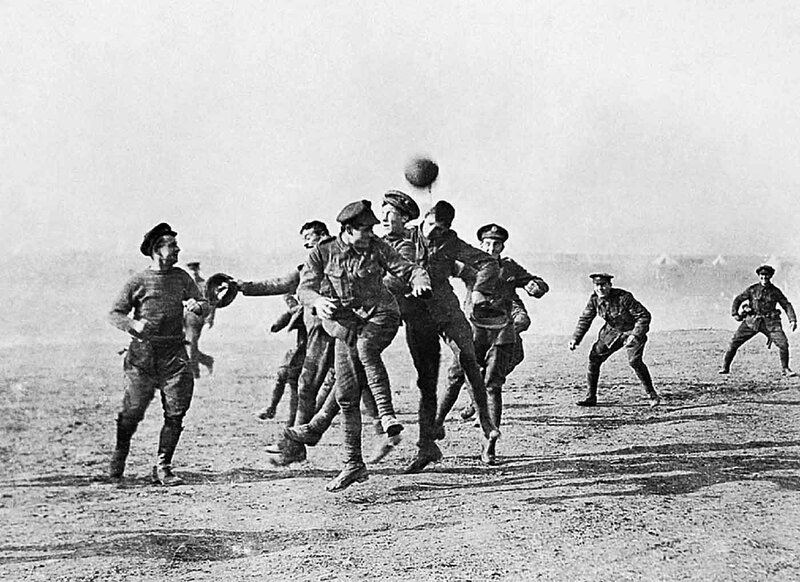 The Christmas truce, through a football lens, is nothing short of inspiring. The variances of the accounts draw us in over a century on. Detractors say the war was stopped by Christmas; others claim it was stopped by sport. However, the truth is that the fighting was not stopped by either – it was humanity that stopped the fighting, if only for a day.